There are times when an easy local getaway is all you need without the hassle of booking flights or having to face hordes of tourists. Cherating – located in the state of Pahang – is essentially a fishing village, which became a bit of a backpacker spot, albeit with a Club Med in the vicinity. One of the easiest choices for a weekend break for city dwellers in search of a little easy R&R. It’s also one of the only places to surf in Malaysia with the season running from November to March (monsoon season). The high season lasts between April and October where blue skies and beautiful sunsets are the norm. The hotel scene in this area has always been to either stay in that famous French all-inclusive resort, backpacker chalets or local hotels. A boutique hotel was exactly what was needed and The Kasturi Resort fills this void admirably. 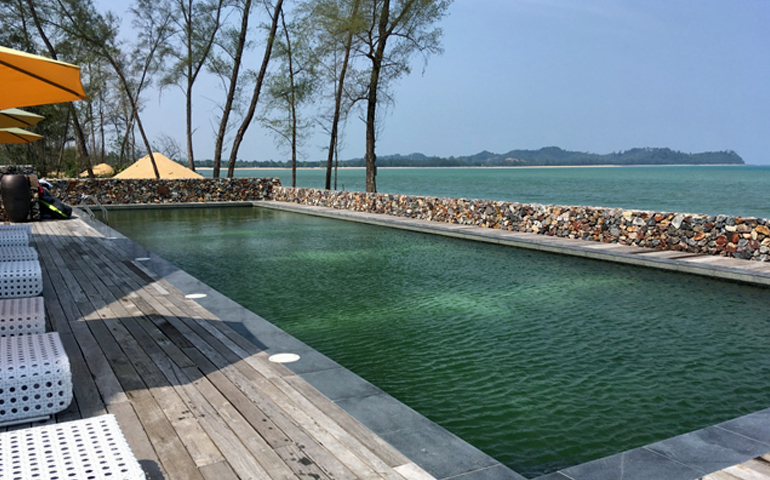 Owned and designed by Hijjas and Angela Kasturi (Hijjas being one of the most prolific architects in the region), the resort is spread over 15 acres and has generous beach frontage. Accommodation comes in several forms with the two-bedroom beach-facing villas being very popular with families and groups. These have their own pool, which is always treat particularly if you want privacy and / or you have younger children. The two-bedroom Rooftop Penthouse is also a great option for families or friends and has a balcony with fantastic views and loungers for sunbathing. There are also smaller rooms like the Ocean View Suites that are ideal for couples. The Kenyang Restaurant was a pleasant surprise as the food was great and reasonably priced. Considering the resort is a bit of a drive away from the nearest local eatery, it’s good to know that you can have a delicious meal facing the sea or have it delivered straight to your room. There’s an appetising mix of local and international dishes alongside chef’s specials. The fragrant rich curries imbued with local herbs and spices, interesting starters using local seafood, and desserts with a definite Malaysian slant are all worth trying. It’s important to note that the owners built a turtle hatchery when they began building the resort, and every effort was made to keep the surrounds intact and build using local materials and recycled timber. Existing trees were incorporated into the design, elevated walkways were constructed to ensure minimal contact with the ground, and rain water is collected for toilets and watering the garden – these are just the some of the many sustainable practices that the resort is built upon. One of the most appealing things about The Kasturi is that once you’ve settled in and recovered after the possibly manic drive from KL (3.5hours, less without traffic), it’s just so relaxing! And there’s nothing like the sound of the waves to remind you that there’s more to life than being a cog in the machine.